Black as a cafe. Black as a night. Black as a... The famous actress TV-star and model Tyra Banks in neoprene catsuit and leather body armor in "Model to Mogul and Beyond" photographed by Udo Spreitzenbarth styled and produced by Ty-Ron Mayes for Korean style magazine West East Mag, issue 37 BLACK. Tyra Banks in leather, neoprene and metal. It's amazing photoshoot. Opera length gloves, leather dress with cross applications of Versace and more delicate details of leather in this editorial entitled "The Scarlet Focus". 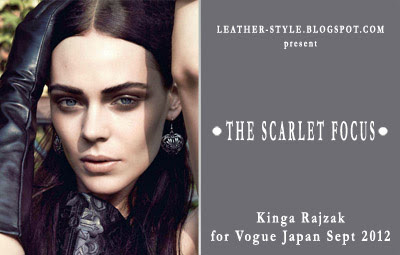 On focus is the beautiful face of Vogue's cover model Kinga Rajzak shooted by Jem Mitchell for Japanese edition of the magazine. Clothes, boots, bags - all of leather and fur. Creative director of fashion brand Céline Phoebe Philo has received complete freedom to express her vision to the Céline Pre-Fall 2012/2013 ready-to-wear collection: fur coats with classical length, leather skirts and trousers, blouses and T-shirts of leather, thigh-high boots of black and white leather, handbags of leather and fur or as a combination of both. The british designer Phoebe Philo started at Céline in October 2008. In June 2011 Philo is honoured with prize "International Designer of the Year" by the CFDA after it been awarded twice "British Designer of the Year" by the British Fashion Council in December 2010 and in 2005. 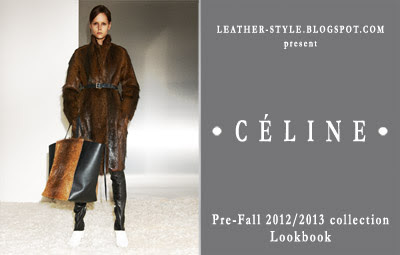 Céline is a French luxury brand founded in 1945 by Céline Vipiana. Since July 1988 the brand is owned by company LVMH, based in Paris, France.